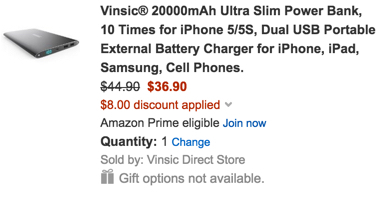 Vinsic Direct via Amazon offers the Vinsic 20000mAh Ultra Slim Power Bank for $36.90 Prime shipped when you use the code 3XZMFPFS at checkout. That’s $8 off the regular price and the lowest we’ve seen it offered at Amazon. This ultra-slim power bank has a hard plastic & aluminum alloy body and can charge an iPhone 10 times. Also, with two USB ports it can safely charge two devices simultaneously. Rated 4.3/5 stars from over 580 Amazon customers. 10 times for iPhone, this Vinsic 20000mAh Ultra-slim Power Bank is designed with two USB output ports will quickly and effectively help to solve the low power problem for your digital device while traveling out. With such high capacity, in such a compact package, it is perfect for traveling, business trips, or just any time you’re away from an outlet. It is convenient to carry anywhere with a compact size. It is your optimal choice.